This article is part of a Huffington Post series, on the occasion of the site's 10th anniversary, looking at some of the people and issues that will shape the world in the next decade. WASHINGTON -- Over a decade ago, the Federal Communications Commission stood firm against indecency on the airwaves. It took a hard line against expletives on award shows and became a punchline for many, including rapper Eminem. Today, those efforts seem petty and antiquated, the last vestiges of a culture war. Yet rather than fade away with those old disputes, the FCC has now assumed a central role in shaping America's digital future. 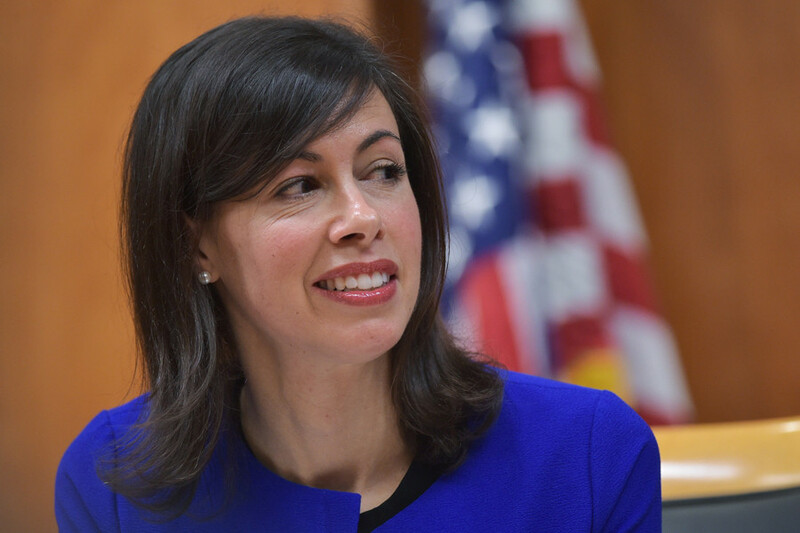 As profound as our reliance on data is today, FCC Commissioner Jessica Rosenworcel says it’s only beginning. Around the bend lies the “Internet of Things,” where billions of machines with sensors -- everything from heart implants to thermostats -- will communicate with one another over vast networks. Rosenworcel, who was confirmed as an FCC commissioner in 2012, works in a no-frills federal building in Washington that could have served as a set for the movie "Office Space." It's a far cry from the sun-drenched campuses of Silicon Valley, but no less important to digital influence. As of 2013, there were over 335 million active wireless devices in the United States, more than the U.S. population. We use Wi-Fi to stream TV and movies, chat with friends and loved ones, look up directions, do our jobs and our schoolwork, even call 911 in an emergency. And Rosenworcel is determined that everyone has access. The issue of broadband access leapt into the national spotlight this year as activists battled the country's major telecom and cable companies over the principle of net neutrality. Internet service providers oppose strong FCC regulations that prohibit them from prioritizing certain web traffic. Supporters of net neutrality argue that all Internet traffic should be treated equally. In February, the FCC, led by Democratic Chairman Tom Wheeler, passed robust net neutrality rules by a vote of 3-2. The agency's two Republican commissioners opposed the decision, but the other two Democrats, Rosenworcel and Commissioner Mignon Clyburn, sided with Wheeler to cast the deciding votes. Rosenworcel, 43, spent the bulk of her childhood in Hartford, Connecticut. Her father is a nephrologist, and her mother has helped run a soup kitchen for more than two decades. Her brother plays drums in the alternative rock band Guster, and her husband is a media lawyer. After practicing communications law in the private sector, Rosenworcel got her start at the FCC in 1999 working for the Wireline Competition Bureau, which aims to ensure that all Americans have access to affordable communications. In 2003, she started working for then-FCC Commissioner Michael Copps. Copps is a staunch advocate for the public interest -- when the FCC approved the merger of Comcast and NBC-Universal in 2011, he was the lone dissenter -- and Rosenworcel took his views to heart. Rosenworcel also took inspiration from her bosses on Capitol Hill, where she worked starting in 2007. She served as senior communications counsel for the Senate Committee on Commerce, Science and Transportation under then-Chairman Jay Rockefeller (D-W.Va.), another man unafraid to make cable companies squirm. They labored over legislation to create a broadband network for first responders, designed to counteract the problems that emergency personnel faced during the Sept. 11 terrorist attacks. Creation of the network, still a work in progress, was in part personal for Rosenworcel, who lost a relative in the Twin Towers. These days, Rosenworcel is firmly focused on tomorrow's technological challenges. "It is time to supersize Wi-Fi," she told the crowd at the SXSW Interactive conference in Austin, Texas, in March. Despite the seeming ubiquity of Wi-Fi, about 5 million households with school-age children do not have high-speed Internet access at home, according to an analysis released in April by the Pew Research Center. But at least seven out of 10 teachers assign homework that requires Internet access, Pew has reported. Rosenworcel frequently draws attention to this discrepancy, which she calls “the homework gap.” She has pointed to Pinconning, Michigan, for example, a town with a population of about 1,300, where parents reportedly drive their kids to a fast food franchise so they can get online and do their homework. Kids who can’t afford food sit in the parking lot. To address this, Rosenworcel and her fellow FCC commissioners want to expand public access to high-speed broadband. Last year, they updated the government's E-Rate program, which brings discounted Internet access to schools and libraries, and increased funding for it by $1.5 billion annually. Rosenworcel champions the idea of setting aside more space in the airwaves for Wi-Fi. Americans' demand for wireless -- for laptops, speakers, video game consoles and other Bluetooth devices -- is skyrocketing. To manage this traffic, the FCC parcels out the airwaves through a process known as spectrum allocation. Rosenworcel is a big advocate for setting aside more spectrum for consumers' use, as well as essentially paying federal agencies to release spectrum for commercial use. To her, however, expanding Wi-Fi access isn't just about helping people get online. The Internet, she believes, will help build stronger schools, improve city services and unleash more Americans' creative potential. It's also critical to U.S. competitiveness in the global economy, which depends on having a tech-literate workforce. Rosenworcel also hopes to break down another major roadblock to America's future success: the lack of diversity in science, technology, engineering and mathematics. “When it comes to technology, there are too few women in the room,” she told HuffPost. At the time of our interview, she was reading The Innovators by Walter Isaacson, a history of the digital revolution that inescapably demonstrates the traditional dominance of white men in technology and yet also highlights Ada Lovelace, a 19th century mathematician credited as being the world's first computer programmer.